Welcome! 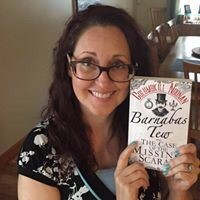 Today I’m hosting a spot on the Great Escapes Virtual Book Tour for Barnabas Tew & the Case of the Nine Worlds by Columbkill Noonan. This was a very interesting book. Before we get into my review, we have a guest post from the author. Information about the book along with my review, will be below the guest post. 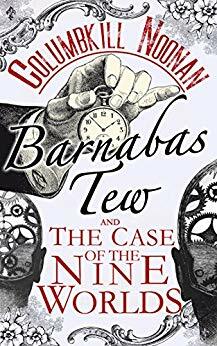 “Barnabas Tew and the Case of the Nine Worlds” is the second book in the Barnabas Tew series (the first was “Barnabas Tew and the Case of the Missing Scarab”, which was released last year). Many readers have remarked on the unusual premise to the series, and have wondered where in the world the idea for the series came from. Well, wonder no more; I’ll tell you all about it! But first, here’s a bit of background information for those who are new to the series. Barnabas Tew is a detective in Victorian London (well, he tries to be, at least, but it seems that he’s not terribly good at it). So far so good; it’s like any other cozy mystery, with a detective who’s in over his head and yet somehow has to solve a case that just might be beyond his capabilities. But then the weird stuff happens. Why, you may be asking, would I want them in an afterlife of any kind, let alone a mythological one? Why can’t they just solve mysteries in London, like any other proper Victorian detectives? Doesn’t the whole “being dead” thing take the books straight out of the realm of “cozy mystery” and put it more in the “fantasy” genre? Yes in that the settings are, of course, rather fantastic. First they have to deal with the gods and goddesses of Ancient Egypt, who are very strange indeed; now they’re embroiled in the heart of Norse mythology, and all the craziness that entails. There are fantastical creatures and characters, and the events are very unlike anything that one might imagine happening in Victorian London. But, if you can suspend disbelief for a while, and accept the odd premise, well, then, you’ll see just how cozy “Barnabas” really is. He’s not a perfect character (he’s nervous, and quirky, and more than a little stuck in his ways), but he’s also earnest, and idealistic, and loyal to a fault. He and Wilfred are an unshakeable team, and they deal with whatever the afterlife has to throw at them with aplomb (and, to be honest, a little bit of panicked flailing, to boot). And really, people are people, no matter where (or when) they happen to be. It doesn’t matter if you’re a seamstress in Victorian London, a mouse-headed waitress in the Egyptian desert, or a warrior-maiden in Valhalla; you’ll have more similarities in terms of motivation and personality than differences. And isn’t that what makes things cozy? I think yes. Barnabas and Wilfred, two earnest but bumbling Victorian detectives, travel through the Nine Worlds of Norse mythology, trying to stave off the impending end of the world – an event which the locals call Ragnarök. This time, however, the intrepid twosome has some help: a brave Viking seer named Brynhild and her flying horse. Can the two plucky detectives and the fearsome Brynhild outwit those who would bring about Ragnarök? Will they survive the harsh conditions and terrifying creatures of the Norse afterlife? This was definitely an interesting book, but I personally did not like it. That’s not to say it’s not a good book though. It’s a mostly well-written book; it did not fit my personality and likes/dislikes. The characters are well-rounded, complex, and intriguing. Barnabas is a stiff-lipped, proper, British gentleman who doesn’t do well going with the flow. He’s abrasive and arrogant, which gets him into more trouble most of the time. Wilfred on the other hand is a little better at going with the flow and learning the customs of the various places they visit. Brynhild gets a bit exasperated with both of them but she’s very patient, all things considered! The setting descriptions were well-done. There were enough details to give you a good imaginative picture, but not so many that your imagination can’t fill in the blanks. Those are the best kind of setting descriptions in my opinion. It was interesting visiting all the worlds in the Viking world. The plot was good, but I felt the story broke down a bit because of all the explaining of Norse Mythology. Now, the explanations were necessary if one doesn’t know much about Norse Mythology (which I don’t) and I don’t really have a suggestion on how all of that could be incorporated into storyline more smoothly, but it simply got in the way of the story line. If you’re going to read this book, I recommend starting with the first book, Barnabas Tew & the Missing Scarab. While the second book can definitely be read on its own, you might understand a few references in the book a bit better if you’d read the first book. Check it out and see what you think. Just because it wasn’t my cup of tea doesn’t mean it won’t be yours! It’s still a well-written book! Thanks for joining me today! Today is the beginning of the tour, but if you wish to visit other tour participants later in the week, just click on the banner below and it’ll take you to the main tour page!